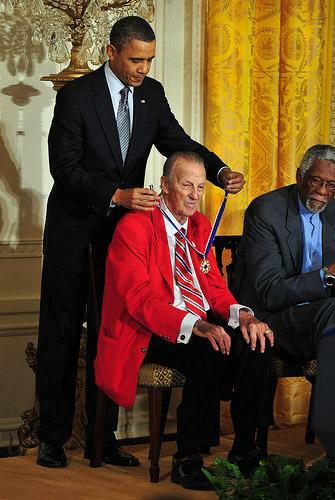 The White House announced in November that Musial would receive the award. Musial was named the most valuable player three times and played in 24 All-Star Games in his career. He also acted as an unofficial American emissary to Poland and has worked closely with several charities. The Beacon reports Sen. Claire McCaskill, D-Mo., who attended the ceremony, said it was "very exciting" for all Cardinal fans. "This is a guy who is a role model for all professional athletes," she said. "In fact, he's a role model for every American." 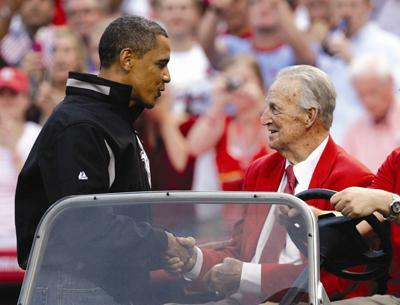 Rep. William Lacy Clay, D-St. Louis, released a statement following the ceremony in which he called Musial a "national treasure" and quoted former baseball commissioner Ford Frick's words inscribed at the base of Musial's statue at Busch Stadium: "Here stands baseball's perfect warrior. Here stands baseball's perfect knight." And what did Musial have to say about the current signing situation with Cardinals first baseman Albert Pujols? Musial said he was confident the Cardinals would sign Pujols to a new contract but said he didn't know when, the Beacon reports. "I'm sure they will" sign Pujols, he said. "He's a great hitter and a home-run hitter." Among the other recipients of the Medal of Freedom today was poet and author Maya Angelou, who was born in St. Louis.